Rated R for strong language including a scene of sexual dialogue. 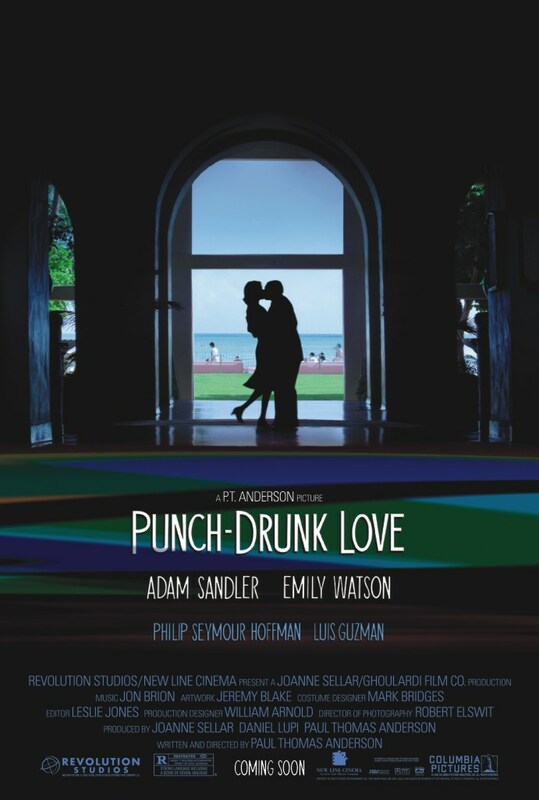 Barry Egan (Adam Sandler) is a small business owner with seven sisters whose abuse has kept him alone and unable to fall in love. When a harmonium and a mysterious woman (Emily Watson) enter his life, his romantic journey begins. Barry Egan runs his own company, is continually hounded by his seven sisters, and every now and then gets a tiny bit violent. One odd morning a harmonium first appears in the street then a striking young lady asks for his help with her car. She re-appears a few days later and there seems to be a spark between them, but can they possibly cut through his seemingly over-complicated life and his somewhat unusual interpersonal skills? The stuff dreams are made of. 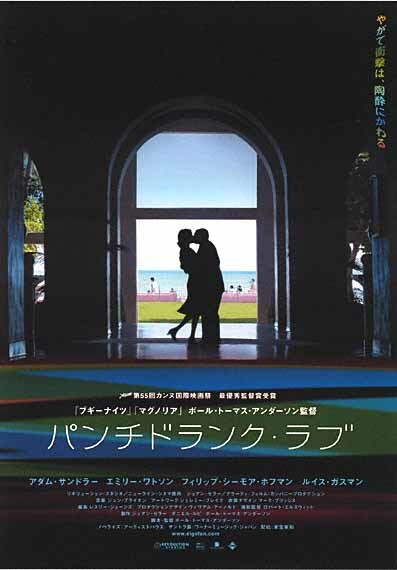 I saw Punch Drunk Love at the Gothenburg film festival today and I was totally overwhelmed by it. I had really looked forward to it since I love Paul Thomas Anderson's earlier films. Magnolia is still among my top five favourite movies ever and my expectations were therefore almost too high. I must admit I was sceptical of Adam Sandler playing a serious part. But he makes fantastic interpretation of his character Barry Egan, a small business owner pushed around by his seven (!) sisterswho's miserable life takes a turn when he meets love in Emily Watson's character. Watson makes a beautiful portrait of the mysterious and lonely Lena who falls in love with Barry. The movie isn't just well acted, it's also magnificent to watch. The camerawork is exquisite and Anderson really shows of his visual talent. Every frame in the one and a half hour film could be frozen and displayed as a piece of art. But the most impressive thing in the film is still Adam Sandler. Every word, expression and nuance is perfect and genuine. If this doesn't deserve an Oscar nomination I don't now what will. His performance is superior to the last five winners. 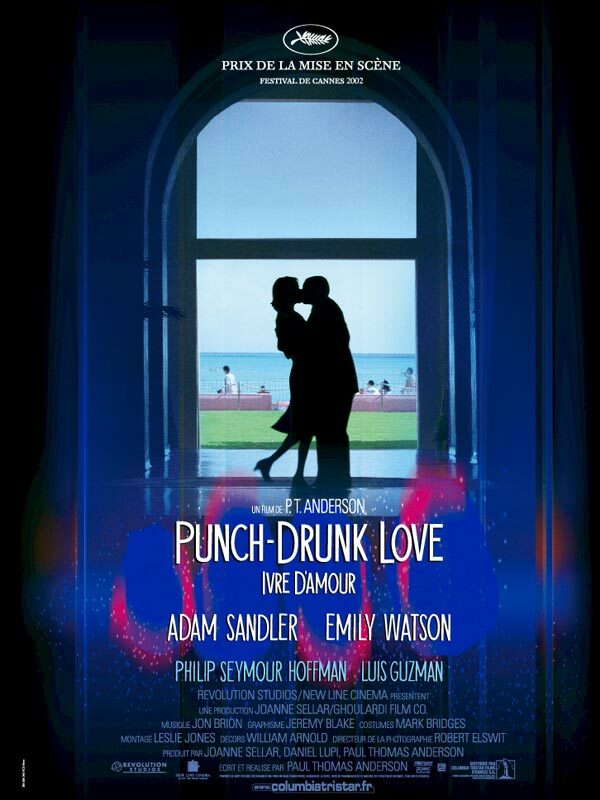 Punch Drunk Love is the way a movie should be. It's the way you wish all movies were like and I wish I could hang it on my wall. The poster will have to do.